Well, let’s start with the number. Tens represent the end of one cycle and the beginning of another. Nines are like reading the last chapter in a book… there’s still a bit more to go, a few loose ends to tie up – whereas tens are finishing the last word on the last page, closing the cover, and looking for a new book to read. It’s the “tween time” – in between cycles. I guess, now that I’m thinking about it, I can compare it to the moon’s “void-of-course” phases, where it’s already left the house of one sign, but hasn’t yet reached the other. With the ten, we’ve left the cycle we just completed, but haven’t yet arrived at the new cycle. And the wands? Wands represent fire, transformation, change, new insights, new awarenesses, new possibilities, new perspectives, new opportunities. Wands are the seeds of change and transformation. In short, in relation ONLY to myself (and not necessarily the way I’d translate this card for someone else), it implies that the last cycle I went through changed me completely, and by the time I reach the new cycle, I’ll be transformed – if not physically or fundamentally, then in how I view the world, how I process my own emotions, how I “navigate” my journey. 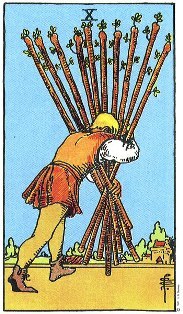 Looking at the picture on this card, we see a man gathering up ten wands, ten opportunities… trying to conquer them all at once. He’s set in his work, determined to do things all by himself (that gave me shiver me timbers!). He’s able to carry his load… and we can see by the muscle mass in his arms and legs that he’s strong and capable. Looking deeper, we can see that he’s carrying his wands toward a town… as if he’s taking his work or his opportunities to a new place. In fact, going back to my first paragraph in comparing this card’s number to the moon void-of-course phase, we can clearly see that this man has left one location and is in route to another, but hasn’t yet reached his destination. That being said, it would make much sense to me for this card to indicate a change in location regarding work or home, a transformation of residence in the way of work, home, or both. When I’ve drawn this card for others, my instictive interpretation was that they may be too involved in or too absorbed by their work, that they’re trying to do too much at once, or that they may be overwhelmed by the tasks at hand. I’m not sure why today’s reflections are steering me away from my “standard” interpretation and leading me to a different understanding. Well, I can most certainly see where the referenced definitions are right on target – as is my traditional or “standard” interpretation of this card when it comes up in readings I do for others. Heck, anyone reading my blog can tell that I’m over-worked, that I feel the responsibilities of being a single parent (not that I’d choose any other way, mind you), and that I’m forever waiting for that vacation, weekend, getaway that will allow me to let my hair down, take off my shoes, and exhale. There is a constant drive, and I write over and over and over again that I don’t have enough time to do all the work that needs done – that I’m overwhelmed. Not sure why I strayed off into my own instinctive interpretation of transformation and relocation… although I cannot rule out that instinctive understanding. If it came to me that way, I believe there’s a reason for it. First, a look at the wands. Wands indicate new beginnings, new awarenesses, new insights, new possibilities, new thought processes, and the passion of inspiration. Wands represent the Air element, the mental realm – the world of thought (The season Spring in terms of time). Wands are like the seeds that could “spring forth” new growth. The two indicates a choice, duality. There are two wands (possibilities) to choose from. Twos can also indicate that good things are coming, but not as soon as one might think or hope. There’s an element of indecisiveness in this card. Indecisiveness is not always a bad thing, and the “knowing” to consider the options carefully before acting impulsively or irrationally can be a good thing. In fact, in this card, the person we see is one of a mature status, robed (Royal). The red cap (Crown) he wears is a symbol of knowledge, wisdom, and power – meaning he’s carefully considering his options and weighing the possibilities (as well as the consequences). We also see that he holds the world in his hands. He can mold it to his own desires, once he’s decided what his true desires are. This card strikes me because of the placement of the world. It is perfectly synchronized with this morning’s Fairy Oracle in that the world is being viewed from the outside in, not from the inside out (See how the two decks work together?). Message confirmed: DETACH AND BE THE OBSERVER. This is not a time of action, but a time of careful consideration. There’s a choice to be made, but it doesn’t have to be made right now this instant. Take time, consider carefully, weigh the options, and base decisions on the knowledge gained from previous experience. Don’t be impulsive. And now, let’s reference the other sources just for good measure. 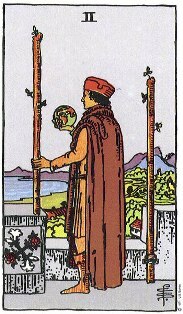 The Two of Wands glorifies individual courage and greatness. This card taps the same energy as the Magician, but with one important difference. The Magician represents the archetype of power – the impersonal energy of creativity and strength. 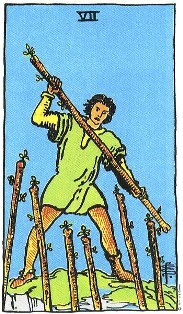 The Two of Wands stands for that power brought down to Earth and made personal. Personal power is an invigorating force that fills you up and lends you the courage to be great. A powerful person is like a magnet that attracts all those within a certain area. True power always comes from the Divine. It passes through us and then flows out into the world. When we understand this relationship, we are blessed because this flow brings with it a tremendous feeling of expansion and fulfillment. We feel as if we can accomplish anything. Problems develop when we forget that we are not the source of power, only its conduit. We must be careful not to let the intoxicating feelings that come with power overwhelm our good sense and blind us to our true desires and intentions. 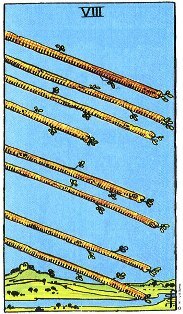 In readings, the Two of Wands indicates that power is a major issue in the situation. You or someone else has it or wants it. When you see this card, look carefully at your goals and activities to make sure you are using power wisely. Don’t support power for its own sake, but enjoy it when it serves your worthwhile purposes. Take this gift and use it to mold your environment in positive ways. 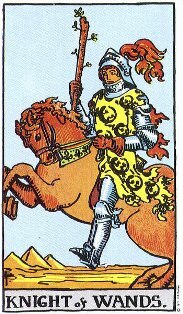 The Two of Wands can also stand for an extra dose of daring and inventiveness. When you see this card, trust that the time is right for the bold, creative move that will knock their socks off. Forget subtlety and old, tired approaches. Allow yourself free rein and you’ll be amazed at the results. Usually a person choosing one wand over another. Wands are passion, and passion is not something that works when split. It requires a single focus. This card indicates a choice about where you put your energy and passion is to be made, but if your instincts are right, the choice will be a right one.